Whilst our speciality is the Barlows Crackling Pig Hog Roast we also offer a wide range of other Roast fair, BBQ's and extra items. Please use the links to view our standard menus, however do contact us if you need something bespoke. As master butchers we select only the finest top quality, locally produced Hog and experty cook and carve for your guests delight. The Hog comes complete with apple sauce and our delicious home made Sage & Onion stuffing and is served with locally produced baked rolls. Hand selected, locally reared Beef served with Mustard & Horseradish. The finest traditionally reared locally produced Lamb roasted in Mint & Rosemary. 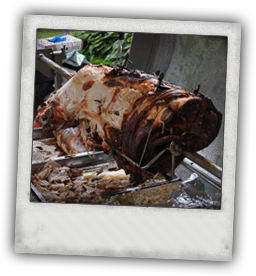 This menu can be used in association with a Full Hog Roast for larger events to provide more choice or is ideal for smaller parties (20 persons and up). All meats and ingedients are sourced locally for the ultimate quality and taste. Sit back and relax knowling your guests are in great hands.. Call us today to discuss your exact requirements. We can cater for 20-500 people. Hand selected, locally grown and then either Roasted, Jacketed or used to to make our very own Bombay potatoes - the perfect side to a Hog Roast. Made to our own recipe using only the finest fresh ingredients - This is not just any coleslaw - you will not find a better one. Simple yet very effective - blanched Mushrooms, garlic and Red onions. A traditional mix of crisp, fresh ingredients, comprising lettuce, peppers& spring onions.